The French Barge ATHOS, cruising the canal du midi in the south of France, is offering a special discount of 10% off their normal rate for a cabin, May 13-19, 2007. Plus, there are still some open weeks available for private charters. Irie, a very popular 74-foot Irwin ketch with aft deck hot tub, is under new ownership and they are offering a 10% discount for January & February 2007 charters. Need a quick break after the holidays? Check this out! The motoryacht FLAME is offering a 20% discount on full-week, all-inclusive, crewed, yacht charter taking place during the month of January 2007 in the Virgin Islands. FLAME's available dates are January 16-28, 2007. 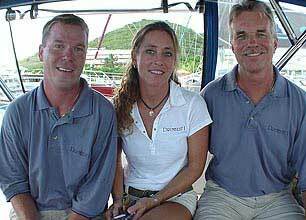 The catamaran Quicksilver, is heading north in March 2007 to charter in the Bahamas. 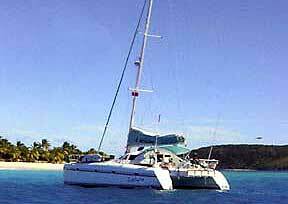 Quicksilver is a 40-foot Dean catamaran that accommodates up to 6 guests in 3 double cabins, each with ensuite heads. Quicksilver's rates will include the 4% Bahamas tax. Sail smoothly into the new year aboard DRUMBEAT. 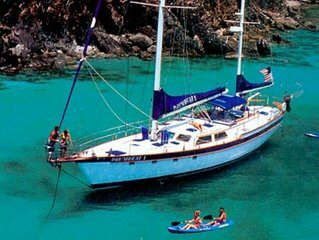 This excellent yacht is offering you a sailing vacation in the Virgin Islands at special discount of 5% off their normal rate for full-week yacht charters taking place during the months of January and February 2007. Vince is a PADI Dive Instructor and Drumbeat includes five dives/week FREE for both certified and non-certified divers. We've had many happy charters aboard Drumbeat and hope that you will be able to take advantage of this wonderful opportunity. Join Vince, Linda, and Kirk aboard this 65/72-foot Irwin ketch for an enjoyable winter break with your family or friends. Drumbeat is fully air conditioned and accommodates up to 8 guests in 4 cabins with double berths, each with ensuite heads.